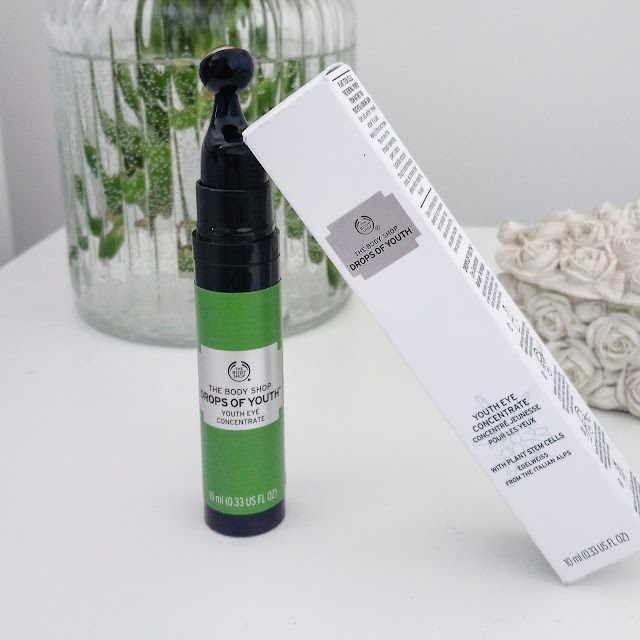 Another Body Shop product, I can almost SEE your eyes start to roll, you guys have to know that I really think The Body Shop has some incredible skincare ranges and I am obsessed with the Resurfacing Liquid Peel and the Youth Cream but I have been honest about my opinion regarding their beauty products such as the CC Cream which was a massive disappointment. I just kinda have a problem with the The Body Shop in the sense that I cannot walk out of there with just one thing so I end up buying a few! You guys already know that I am paranoid about my ever aging face so was on the look out of a little eye cream when I spotted (with my saggy eyes) The Drops of Youth Eye Concentrate, I just saw the words "youth" and "eyes" and knew I had to have it! Like the Drops of Youth Cream this product also has plant stem cells such a Edelweiss, Sea Holly and Criste Marine. It's an unusual little contraption isn't it? Basically it's a pump and applicator all in one! 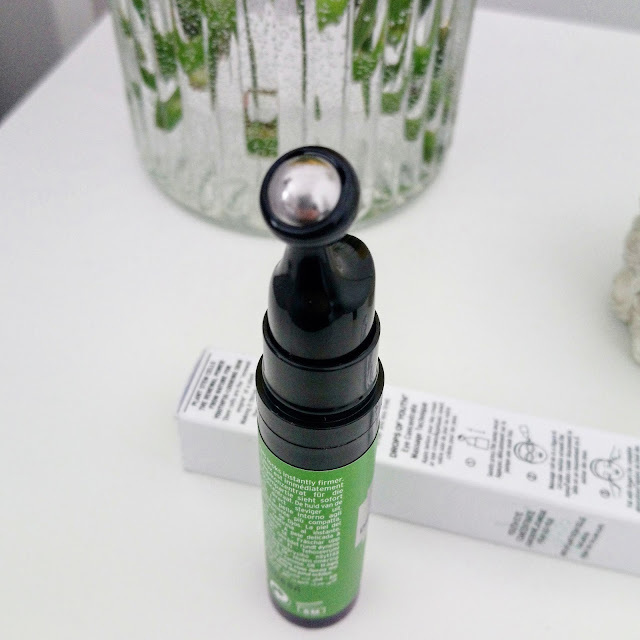 You press down on the little black part which deposits the eye cream around the silver roller ball and then, as instructed by the packaging, you massage the cream around both eyes in a figure 8 motion and then you simply pat it in with your fingers until it is completely absorbed. I'm not gonna lie to you guys but this took me a little while to even remember to keep using, for some reason I really struggled to work it into my skincare routine but I eventually did. The Youth Eye Concentrate is a really lovely product because it's so fresh and light, it also has a cooling quality to it which is helped by the roller ball. I definitely noticed that this product made the skin around my eyes appear more lighter and brighter but I am lucky in the sense that I have quite pale under eyes anyway so don't often have "bags" as such! I have read the reviews online and many people have said that it reduces fine lines which personally I haven't noticed, for me this product is more of a hydrating cream than a cream to reduce wrinkles which I actually wanted. It is a lovely product but I think I want to go for something that is a little more tightening and wrinkle reducing as opposed to birghtening so I won't buy this product again but that's not to say it isn't a great product because it is, I just need something a little stronger to tackle my aging eyes! What eye creams do you recommend?